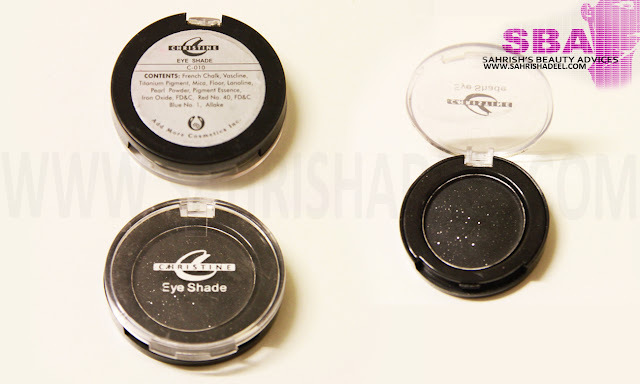 Christine's Eye Shade in Black - Review + Swatch | Sahrish Adeel - Malaysia based Pakistani Beauty & Lifestyle Blogger! It gives a really matte finish and you can achieve, from a very light blackish look to a really heavy smokey look with this eye shadow. My skin and eyes are pretty sensitive, but I did not get any reactions or itchiness by using this shadow. It is also pretty easy to blend as compared to a few other black eye shadows I have used so far and does not leave harsh lines if you spend a little time on blending, as after all it is a dark shade. Left swatch is without primer, while the right swatch is with primer. Except for using the eye shadow for your eyes, you can also use it to fill in your eye brows (if you have dark ones). Use a wet eye liner brush on this eye shadow and apply a matte finished eye liner. You can pack your gel liner with it as well. While going for a more dramatic look with your lips, pat it on your red lipstick to create that Vampirish (self made word :p) look. Cost: I don't exactly remember its price as I bought it a while ago but I guess it was about 150-200 PKR. Check out the Red Smokey Look I re-created using this shadow.What do you prefer, matte or shimmery eye shadows?